The PI3K/Akt pathway is activated by B. cenocepacia, and PI3K is required for inflammatory cytokine production. A, Primary human PBM were infected with B. cenocepacia (B.c.) at a MOI of 5 for 20, 40, or 60 min. Western blots on cell lysates were done to measure pSer473-Akt, followed by reprobes for total Akt as a loading control. B, PBM were pretreated with DMSO vehicle control or the PI3K inhibitor LY294002 (20 μM) for 30 min, and then infected with B. cenocepacia (Bc) at a MOI of 5 for 8 h. To ensure inhibitor effectiveness, cells were lysed and pSer473-Akt was measured by Western blotting, with actin reprobe as loading control. C–E, Proinflammatory cytokine production of PBM from B was measured by performing sandwich ELISAs on cell-free supernatants for TNF-α (C), IL-6 (D), or IL-8 (E). Three independent experiments were done. *p < 0.05, Student t test. R, resting or uninfected samples. 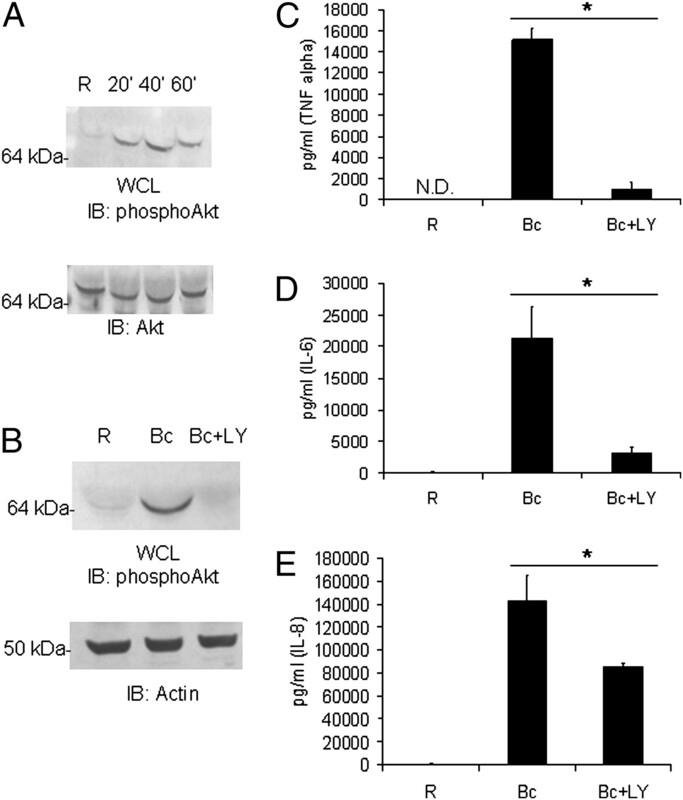 Akt promotes the proinflammatory cytokine production elicited by B. cenocepacia. A–C, PBM were pretreated with H2O vehicle control or the Akt inhibitor Akt(X) (10 μM) for 30 min, and then infected with B. cenocepacia (Bc) at a MOI of 5 for 8 h. Sandwich ELISAs were done to measure TNF-α (A), IL-6 (B), or IL-8 (C) in cell-free supernatants. Three independent experiments were done. *p < 0.05, Student t test. D, Matched PBM samples run in parallel to that of A were lysed, and pSer-Akt was measured by Western blotting, followed by reprobe for actin as a loading control. E, Bone marrow-derived macrophages from wild-type mice and transgenic mice expressing a macrophage-specific myristoylated Akt were lysed, and pSer-Akt was measured by Western blotting. F–H, Bone marrow-derived macrophages from wild-type or MyrAkt-expressing mice were infected with B. cenocepacia (Bc) at a MOI of 5 for 8 h. Sandwich ELISAs were done to measure TNF-α (F), IL-6 (G), and RANTES (H). This represents a triplicate of biological samples. *p < 0.05, Student t test. 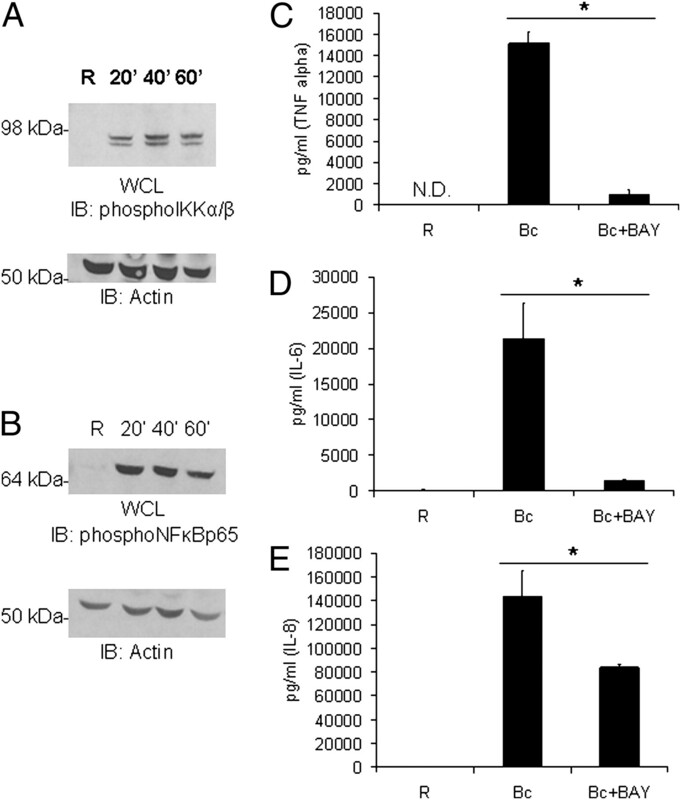 PI3K/Akt does not regulate phagocytosis or intracellular replication of B. cenocepacia within macropahges. A, 4 × 105 bone marrow-derived macrophages (BMM) were pretreated with DMSO or LY294002 for 30 min and then infected with B. cenocepacia at a MOI of 5 for 1 h. At the end of infection, cells were washed and treated with gentamicin to kill extracellular bacteria for 30 min. Cells were washed, lysed, serially diluted, and plated on Luria Bertani agar. Graphs represent the average and SD of recovered CFUs for three independently infected samples. A Student t test was done to determine significance. p > 0.05. B, Wild-type or MyrAkt BMM were infected with B. cenocepacia (B.c.) at a MOI of 5 for 1 h, as done in A. C, 4 × 105 BMM were pretreated with DMSO or LY294002 for 30 min, and then infected with B. cenocepacia at a MOI of 5 for 1 h. Samples were lysed at 1 h or cultured in fresh macrophage culture medium for 8 or 24 h and then lysed. Graphs represent the average and SD of recovered CFUs for three independently infected samples. A Student t test was done to determine significance. p > 0.05. D, 4 × 105 wild-type or MyrAkt BMM were infected and treated, as in C.
The IKK/NF-κB pathway is activated by B. cenocepacia and is required for proinflammatory cytokine production. A, PBM were infected with B. cenocepacia at a MOI of 5 for 20, 40, or 60 min. Cells were lysed and proteins analyzed by Western blotting for phospho-IKKα/β, followed by anti-actin as a loading control. B, pSer536 of NF-κB p65 was measured in matched samples from Fig. 3A by Western blotting and reprobed with anti-actin as a loading control. C–E, PBM were pretreated with DMSO vehicle control or an IKK/NF-κB inhibitor, BAY7085 (5 μM), for 30 min, and then infected with B. cenocepacia (Bc) at a MOI of 5 for 8 h. Sandwich ELISAs were done to measure levels of TNF-α (C), IL-6 (D), or IL-8 (E) in cell-free media samples. Graphs represent three biological samples; *p < 0.05, Student t test. R, resting or uninfected samples. 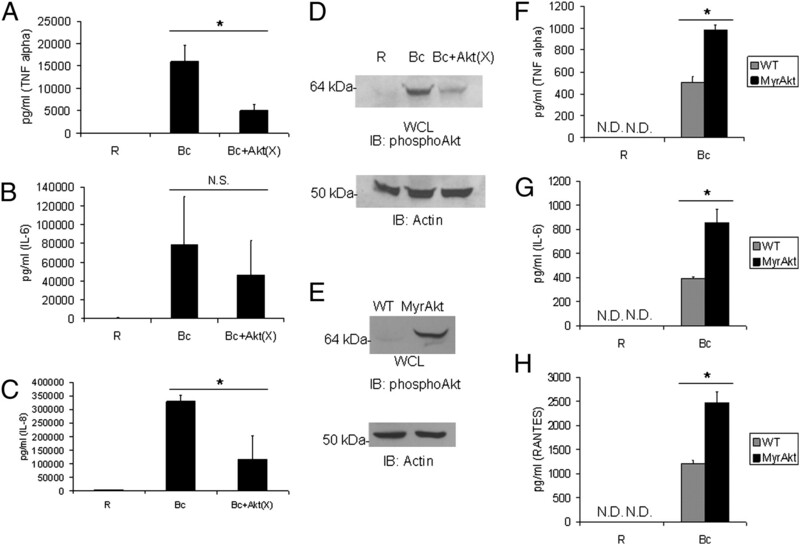 PI3K/Akt do not influence IKK/NF-κB phosphorylation. A–C, PBM were pretreated with DMSO vehicle control LY294002 (PI3K inhibitor) or BAY 11-7085 (IKK/NF-κB inhibitor) for 30 min and then infected with B. cenocepacia at a MOI of 5 for 20, 40, or 60 min. 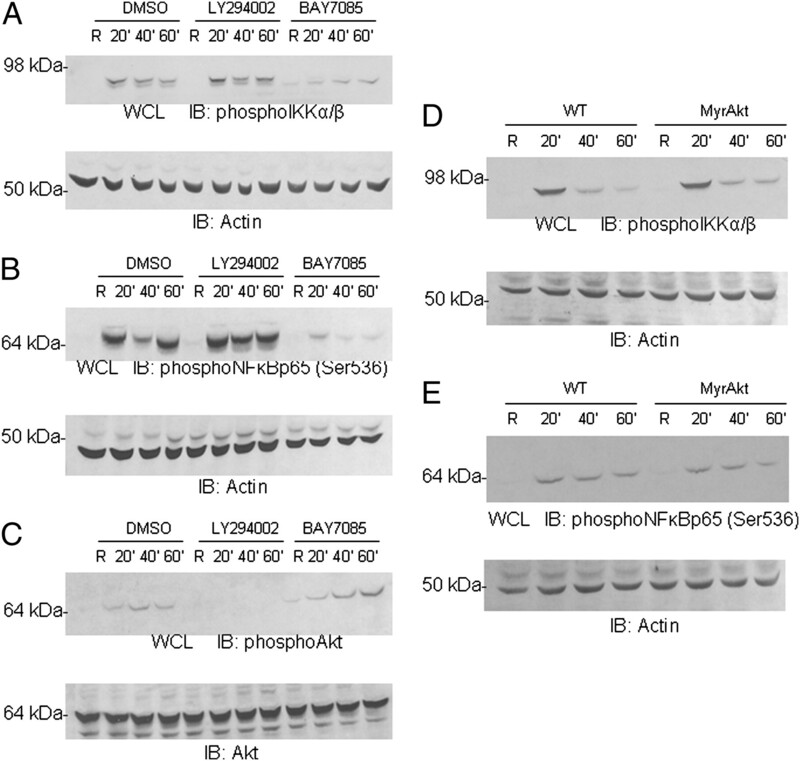 Cells were lysed, and Western blotting was done to measure phospho-IKKα/β (A), phospho-NF-κBp65 (Ser536) (B), and phosphor-serine Akt (C). Actin and total Akt were probed as loading controls. D and E, Bone marrow-derived macrophages from wild-type or myrAkt-expressing mice were infected with B. cenocepacia at a MOI of 5 for 20, 40, or 60 min. Cells were lysed and Western blotting was done to measure phospho-IKKα/β (D) and phospho-NF-κBp65 (Ser536) (E). Actin was used as a loading control. R, resting or uninfected samples. The PI3K/Akt pathway regulates NF-κB activity through GSK3β. A, RAW264.7 cells were transfected with a NF-κB luciferase reporter. Fourteen hours posttransfection, these cells were infected with B. cenocepacia (Bc) at a MOI of 5 for 5 h, the infection time yielding robust NF-κB–luciferase activity (Supplemental Fig. 1). Luciferase activity was measured by a luminometer, and values were converted into percentage of increase over matched resting/uninfected samples. B, PBM were infected with B. cenocepacia for 20, 40, or 60 min. Western blotting was done on cell lysates to measure phospho-GSK3α/β, and then reprobed with anti-actin as a loading control. C, Matched cell lysates from Fig. 5B were tested by Western blotting for phospho-GSK3β, and then reprobed for total GSK3β as a loading control. D, PBM were treated with DMSO vehicle control or the LY294002 for 30 min, and then infected with B. cenocepacia for 20, 40, or 60 min. Western blots were done on cell lysates for phospho-GSK3α/β, followed by reprobing for actin as a loading control. E, RAW264.7 cells were transfected with a NF-κB luciferase reporter plasmid. Transfected cells were pretreated with DMSO vehicle control or SB-216763 GSK3β inhibitor for 30 min, and then infected with B. cenocepacia (Bc) at a MOI of 5 for 5 h. Cells were lysed, and luciferase activity was measured by a luminometer. Data are expressed as percentage of increase in activity over matched uninfected control. F, RAW 264.7 cells were pretreated with DMSO vehicle control or SB-216763, and then infected with B. cenocepacia (Bc) at a MOI of 5 for 8 h. Cleared cell lysates were assayed for TNF-α production by ELISA. Data represent the average of three samples, and error bars denote SD. *p < 0.05, Student t test. R, uninfected cells. 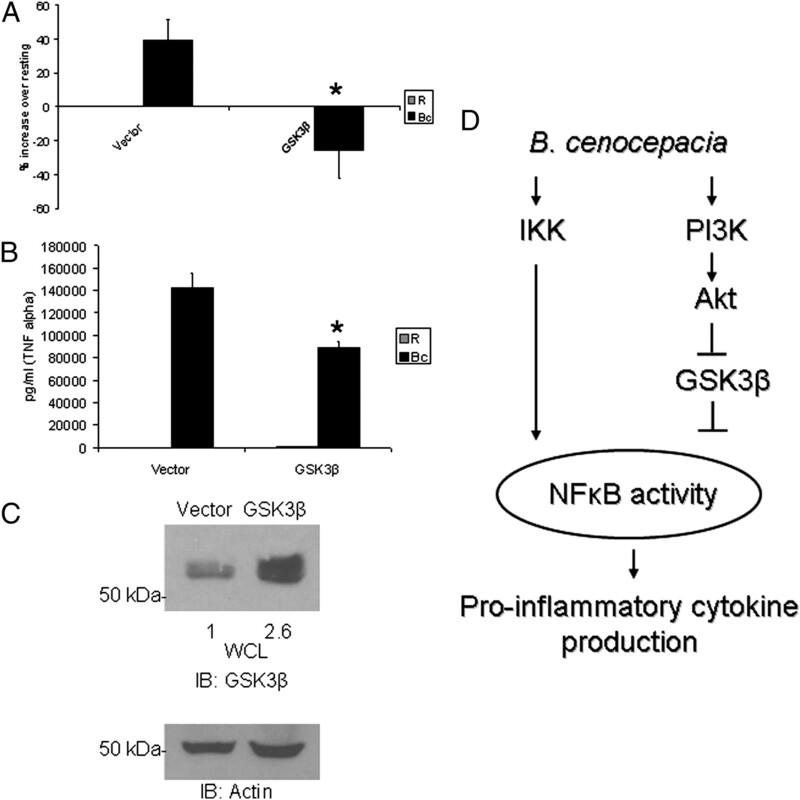 GSK3β overexpression inhibits B. cenocepacia-induced NF-κB activation and inflammatory response. A, RAW264.7 macrophages were transfected with a NF-κB luciferase reporter plasmid and either vector control or wild-type GSK3β plasmid. Fourteen hours posttransfection, macrophages were infected with B. cenocepacia at a MOI of 5 for 5 h. Cells were lysed, and luciferase activity was measured by a luminometer. Data are expressed as percentage of increase over matched uninfected control. B, RAW264.7 macrophages were transfected with vector control or wild-type GSK3β plasmid. Fourteen hours posttransfection, the macrophages were infected with B. cenocepacia at a MOI of 5 for 24 h. Cleared cell lysates were collected and assayed for TNF-α production by ELISA. Data represent the average of three samples, and error bars denote SD. *p < 0.05, Student t test. C, Western blots to measure GSK3β were done with cell lysates from uninfected macrophages transfected with either vector or GSK3β plasmid, followed by reprobes for actin as loading control. Densitometry quantification of GSK3β overexpression is shown and normalized by actin. 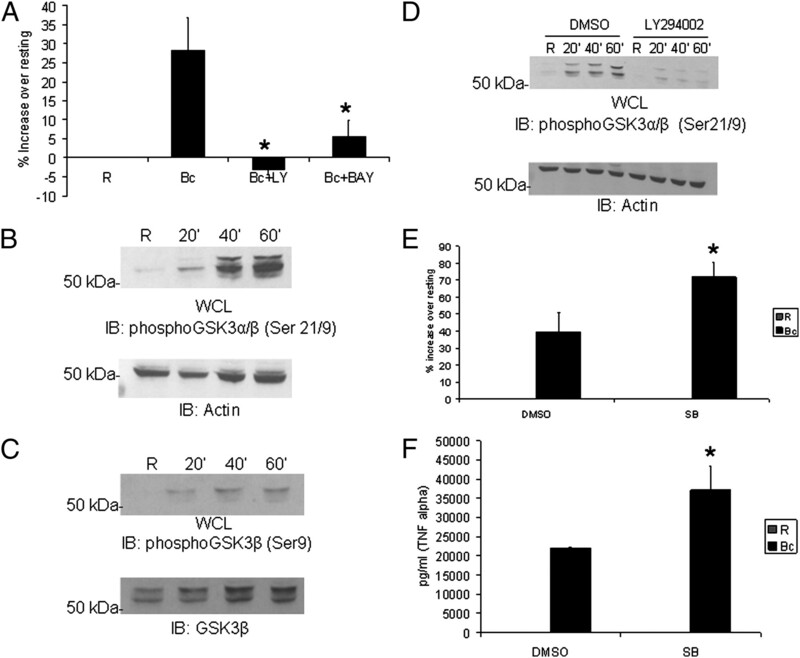 D, Model of interactions among IKK, PI3K/Akt, and GSK3β pathways for regulating NF-κB and inflammatory response to B. cenocepacia. Supplementary Figure 1: Murine macrophages were transfected with the NF-κB luciferase reporter. Suplementary Figure 2: PBM were treated with DMSO or the GSK3β inhibitor, then infected with B. cenocepacia at an MOI of 5 for the indicated time points. Supplementary Figure 3: Murine macrophages were transfected with the NF-κB luciferase reporter as done within the manuscript. Supplementary Figure 4: PBM were infected with B. cenocepacia at an MOI of 5 for 2 hours.